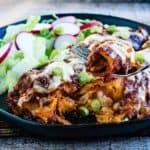 These easy chicken enchiladas are a super simple and very satisfying meal, especially if you already have some Easy Enchilada Sauce in the fridge or freezer. I heat the tortillas in the microwave rather than frying them one at a time in oil. It’s much easier that way, and you easily cut a bunch of calories from the dish. If you’re really pressed for time, you can skip heating the tortillas and just layer the tortillas and filling lasagna-style for an enchilada casserole. In a medium bowl, mix together the chicken, beans, and several large spoonfuls of sauce. Spoon ½ cup or so of the sauce into the bottom of a 9-by-13-inch baking dish. Wrap the tortillas in a slightly damp, clean dishtowel and heat them in the microwave for about 30 seconds. Lay one of the warmed tortillas on the sauce in the baking dish, and then flip it over to sauce up the other side. Put some of the chicken-and-bean mixture in a line down the center and then roll the tortilla up around the filling. Place the filled and rolled enchilada in the baking dish, seam-side down. Repeat with the remaining tortillas and filling, using more sauce to coat the tortillas as needed. Spoon the remaining sauce over the enchiladas in the baking dish and sprinkle the cheese over the top. Bake, uncovered, for 25 minutes, until the sauce is bubbling, the enchiladas are heated through, and the cheese is fully melted. Remove from oven and let stand for a few minutes before serving. Serve hot, garnished with scallions or cilantro, if using.